During February, southern and northern migrations coincide along the Pacific Coast. By mid-month, northbound whales begin to outnumber southbound whales. This eagerly awaited migration event is called the turnaround or crossover period. 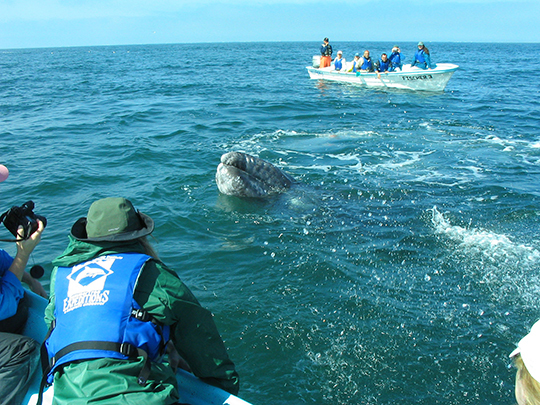 Meanwhile, whales in the nursery lagoons of Mexico reach peak numbers. Mothers are giving birth and nursing their calves. Whale watchers who visit the lagoons are enchanted by the babies. From February to May, two research teams share data from the California coast as northbound whales pass.